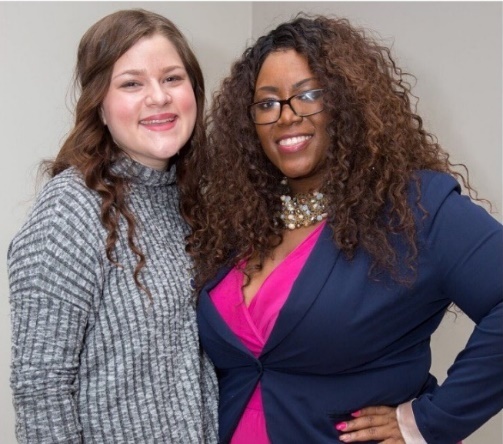 Photo Caption: (Above, R) LaTia Sinclair, Director, Multicultural and Community Affairs, Berkeley College, who created the Berkeley LeadHERship brunch, greets student Kallie McGrath of Manhattan, NY, at Berkeley College in Brooklyn on March 10, 2017. The LeadHERship brunch is a female empowerment event that includes inspirational workshops, engaging panel discussions and networking opportunities. 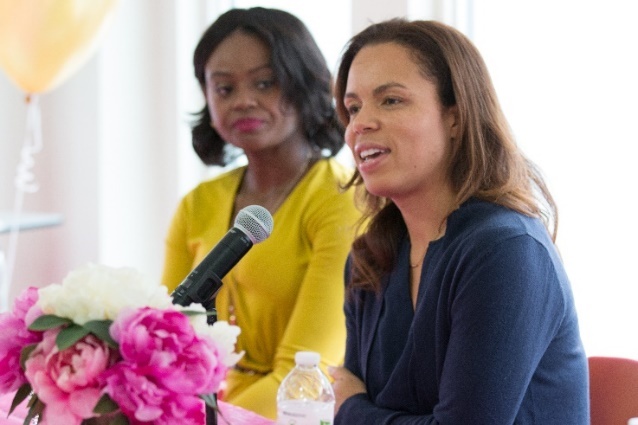 (Below, L to R) Naomi Yane, Reporter, NY1 News, and Miriam Milford, owner of BCakeNY, shared their success stories during the panel discussions. The Office of Student Development and Campus Life (SDCL) created boards, and displayed them throughout the campus, with pictures of women who made significant contributions in the areas of health, criminal justice, fashion, business and science. Students had the chance to participate and win prizes in a trivia contest about these women and their accomplishments. SDCL hosts a display board of trailblazing women and a Women Trivia Wheel. Christine Clifton, the founder of Mindful Business Matters, a motivational organization, spoke to the group about how to make business connections. NaTishia Aromire will speak with students and associates about weight gain and loss. She is a certified Eating Psychology Coach and educator who founded Journey to a FAT (Fear, Anger and Turmoil) Free Life. The Second Annual Berkeley College LeadHERship Brunch, was hosted by SDCL in Midtown Manhattan. Created by LaTia Sinclair, Director, Multicultural and Community Affairs, Berkeley College, this brunch is a female empowerment event that educates and inspires women on how to lead lives they love and achieve their business goals and dreams. A discussion was held in the Student Activities Center about the artist Beyonce and her visual album, Lemonade. Talking points centered around the album as a conceptual project based on every woman’s journey of self-knowledge and healing. The Student Government Association hosted a breakfast club. In a panel discussion, women began conversations with students about current events and pop culture. SDCL and Sista Circle, a student group, hosted a dinner theater featuring Thinking in Full Color (TIFC). The program featured women of color sharing their stories. TIFC hosts various events, sparking dynamic community conversations, and providing a voice to women everywhere. SDCL hosted “Coffee and Conversation,” a monthly event where an associate is invited to talk about leadership and the resources on campus. This month’s speaker was Clarissa Gilliam, Senior Director, Talent Management, Human Resources, Berkeley College. SDCL will kick off Project Prom for Princess Chambers, Inc. The team will collect new and gently used prom dresses, party dresses, evening gowns, shoes and accessories to benefit young women who may be unable to attend their proms due to financial hardships.